Got plans April 9-11? 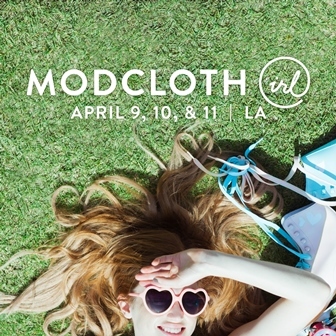 Well, you do now: ModCloth IRL! They’re hosting their 1st-ever fit shop in LA, where you can try on an array of items including dresses, tops, bottoms, shoes, & the requisite cat-printed pieces, meet the peeps behind the ‘screens’, get measurements taken by a pro, & more. Get all the deets and RSVP now on their event page! ← Enter to Win a $25 Amazon Giftcard! !